The Offices of the Grand Chapter is now accepting applications for Chapter Annual Awards, Top TEKE Individual and Top TKE Recruiter. The awards process is designed to provide members with a simple, straightforward means of being recognized for their work during the current fiscal year. The preparation and effort you put into the application will communicate how well your group performed this past year. Applications are due May 15! 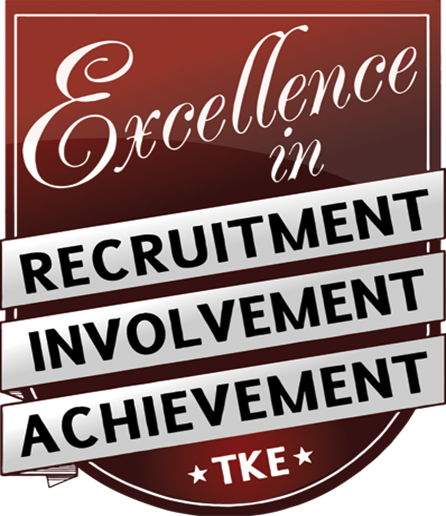 If your chapter meets the minimum requirements for at least four of the seven Excellence Awards, your chapter will be considered for recognition as a Top TKE Chapter. Chapters and colonies that do not meet the minimum requirements for an Excellence Award may apply for Honorable Mention. Chapters that make significant improvements in the areas evaluated by the awards program may also be considered for a Most Improved Chapter Award. To submit your Chapter Awards applications, please complete the Annual Report in the TKE Chapter Module located on the Forms section. By completing the form in full, your group will automatically apply for awards. Click here to submit your Chapter Awards Application. Top Teke Award – This award is presented to a senior or graduate student for an outstanding performance as a member of Tau Kappa Epsilon. The application must include an official copy of transcripts, resume, and high quality head-and-shoulders photograph for publication in THE TEKE magazine. Click here to submit your Top Teke Application. Top TKE Recruiter – This award is presented to an active collegiate member of a chapter that has achieved extraordinary recruitment results. The nominee does not need to have been recruitment chair during the current fiscal year. The application must highlight how this individual's membership recruitment skills are worthy of international distinction. Click here to submit your Top TKE Recruiter Application. If your chapter meets four of the minimum requirements of the seven Excellence Awards, your chapter will be eligible for recognition as a Top TKE Chapter. Chapters and colonies that don't meet the minimum requirements for an Excellence Award can still apply for an Honorable Mention Award. This award is presented to a senior or graduate student for outstanding performance as a member of Tau Kappa Epsilon. The application must include an official copy of transcripts, resume, and a high quality head-and-shoulders photograph for publication in THE TEKE magazine. This award is presented to an active collegiate member of a chapter that has achieved extraordinary recruitment results. The nominee does not need to have been recruitment chair during the current fiscal year. The application must highlight how this individual's membership recruitment skills are worthy of distinction amongst TKE Nation.